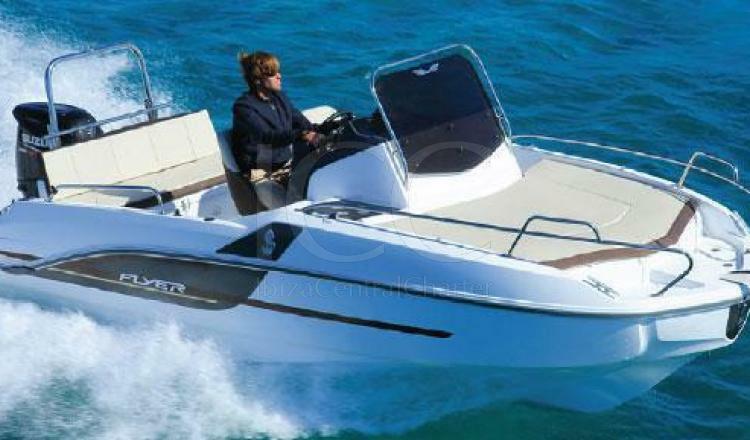 The Beneteau Flyer 5.5 with almost 5.5 meters in length is the ideal boat for a day of charter since it has all the main needs to make the day unforgettable. Its ample bathtub has space for two people in the government position while in its bathtub it has space for 6 more passengers. It has a large sundeck in the bow that is perfect for relaxing in the sun and seats with a foldable backrest for resting outdoors. The boat is equipped with a bimini awning to increase the comfort of the passengers on board, as well as a large bathing platform to make the entrance to the turquoise water of the Mediterranean Sea more comfortable and simple. Undoubtedly, the Beneteau Flyer 5.5 is ideal for a day of sun and sand with a group of friends or family of up to 8 people. 50% at the booking moment, 50% before go on board.